Gavin Henrick works as the Moodle Community Projects Manager at Moodle HQ. Gavin has worked with technology in business, learning and development for over 10 years and has been working with Moodle, Mahara, DSpace and other open-source applications for the last 4 years. Through experience of a wide suite of tools Gavin is able to advise on a wide range of consultancy solutions. Gavin is an active member of the Moodle community and is a regular speaker at a number of Moodlemoots and conferences on the use of Moodle focusing on practical examples of usage. 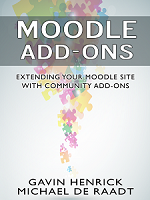 He also blogs on Moodle including reviews of community created plugins, projects and themes. Gavin recently co-authored the book Moodle 2.0 for Business Beginner’s Guide with Jason Cole and Jeanne Cole. This was published by Packt Publishing in May 2011. If you want to contact me please fill out the contact form. Not bad at all… Good to see you’re getting to grips with Alan Turing’s baby..